Jordan is the main technical support for the Digital Scholarship Center. 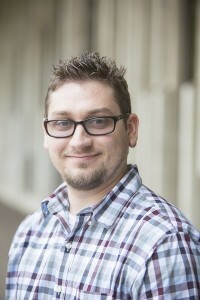 He is in charge of computer and software maintenance as well as training and aiding students and faculty in the use of the various hardware and software the DSC has to offer. Jordan also functions as the DSC’s R&D department, researching and testing new technology and software to add to the DSC’s ever-growing collection. With a background in programming and graphic design, his focus is on 3D and VR development using mainly Unity Game Engine. Before working in the DSC, Jordan worked for the Camden County Library System. There he managed their web server and mobile website development, as well as designing and creating the library’s iOS and Android applications. He co-authored an article for Computers in Libraries Magazine and co-presented at the Computers in Libraries Conference about mobile application development for libraries. Jordan also founded a local independent video game studio. There he functions as lead programmer and as a design lead.